Video: Damon Lindeloff Talks Lost, Star Wars, Star Trek and Prometheus! Video: Extended Clip of David Tennant in FRIGHT NIGHT! Here’s the first long clip of David Tennant as Peter Vincent in the remake of Fright Night. I think Tennant fans will be very pleased. He’s oh so very Tennant-ish. Video: Third Video Diary for THE HOBBIT! You get to see P.J. do a bit of acting in this one. And lots of fun stuff about the first block of shooting. Stick with this one till the end. There’s a very special surprise in store! 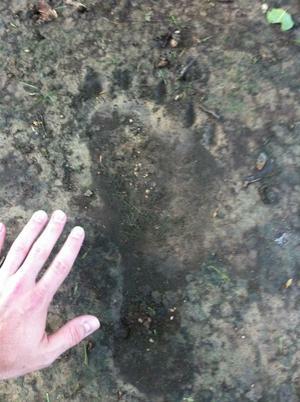 Bigfoot Footprint Found in Illinois! The footprint above measures 18 inches long. It was reported to the Chatham, Illinois police by local resident Michael Patrick. The print had been discovered by crewmen who were replacing a pool liner on his mother’s property. The night before strange animal noises had been heard in the area that had spooked a neighbor’s German Shepherd. As yet there is no explanation for the unusually large footprint. Nor for a series of five “claw marks” found nearby. You’ve probably already all seen this. We forgot to post this a few weeks back. So, call us completists, but we had to post it anyway. And, if you haven’t seen this one, it offers some insights into the production schedule. A bit about the end of the first block of shooting. And some location scouting for the next block. Enjoy! Video: Is This the Best Evidence of Reincarnation? We’re not especially convinced. The boy is almost never allowed to speak for himself. Mostly it’s just the parents relying information which we are just supposed to accept. Is there something strange about the alignment of the skyscrapers in Manhattan? Something similar to the astrophysical alignment of Europe’s stone circles, like Stonehenge? Well, many have noticed this. Chief among them the astrophysicist Neil deGrasse Tyson. He even coined the term “Manhattanhenge” to explain this similarity.